Studying abroad can be an incredible experience – if you’ve laid the right groundwork. It’s normal to encounter culture shock and disorientation when you’re immersed in a new culture and language, and a little preparation will go a long way towards making your time abroad rich and rewarding. By reflecting on the differences and challenges you’ll encounter overseas, this course helps you develop strategies and approaches to deal with cultural collisions and the stresses of living in a new environment, so that you’re mentally prepared to get the most out of your overseas adventure. Articulate objectives for their global mobility experience which is specific to personal growth aspirations. Recognise the stages of culture shock and identify strategies to manage the positive and negative effects associate with adjusting to a new culture. 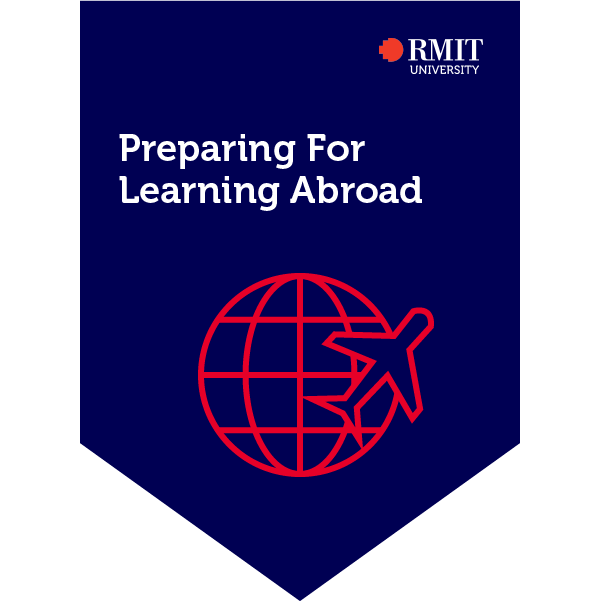 Recognise responsibilities as an RMIT student while overseas, including ambassadorship. How to respond in the event of a travel or safety incident. How to maintain good health while abroad and respond to a medical emergency. How to adapt and thrive in your new cultural environment by embracing the stages of culture shock. How to represent RMIT while abroad as a positive ambassador and fostering good relationships with others. How to identify personal growth objectives while learning abroad. By completing three short written pieces the earner of this credential showed an understanding of how to deal with culture shock and how to represent themselves and their institution in a foreign country. This Credential was endorsed by the International Education Association of Australia.